To the honour of God, and the benefit of the poor of this parish; this house was built with Mr. Watts's charity, anno Dom. 1721. In which the sick and aged are taken care of; the ignorant instructed; such as are able to work, employed; and a comfortable maintenance provided for all. By 1812 the workhouse was in a state of decay. An act of Parliament (the Strood Local Act) was passed placing the management of the workhouse in the care of a new body known as the Strood Trustees, similar to the Local Board of Guardians in Chatham and St. Nichols' Parish, Rochester. Under this Act, rates were levied for the repair of the workhouse and other poor relief. Following the Poor Law Amendment Act of 1834, the Strood Trustees lost many of their powers and leased their workhouse to the Strood Board of Guardians, pending the construction of a new union workhouse, plans for which were set in hand in 1835. The old workhouse was demolished in 1853. The parishes of Birling, Luddesdowne, Halling, and Snodland had a workhouse from around 1749 (Hitchcock, 1985). 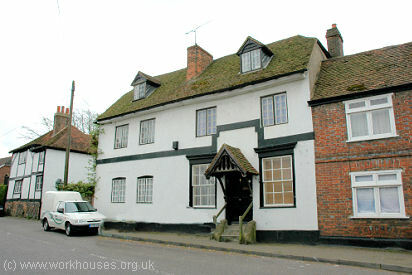 It occupied the former Bishop's Palace at the south side of Ferry Road, Halling. A parliamentary report in 1777 recorded parish workhouses in operation at Cobham (for up to 30 inmates), Northfleet (40), Shorne (20), and Strood (63). Eden, in his 1797 survey of the poor in England, reported that the poor of Chalk "are mostly farmed in a Workhouse with Northfleet". At Meopham, he found that "Casual Poor are relieved at home, orphans and aged persons are provided for by the overseer in a Poor-house in which there are at present 6 aged persons and 11 children. Their diet is generally broth or milk for breakfast, beef for dinner, and bread and cheese or butter for supper every day. The expense, about 3s. a week for each person". Meopham's workhouse, which is said to have been in operation from 1724 to 1834, stood on The Street in Meopham. Meopham former parish workhouse, 2005. County of Kent: Chalk, Cliffe, Cobham, Cuxton, Denton, Frindsbury, Halling, Higham, Ifield, Luddesdown, Meopham, Northfleet, Nursted, Shorne, Strood. The population falling within the Union at the 1831 census had been 12,171 with parishes ranging in size from from Nursted (population 38) to Strood (2,722). The average annual poor-rate expenditure for the period 1833-5 had been £8,490 or 13s.11d. per head of the population. The new North Aylesford Union workhouse was erected in 1837 at the north side of Gun Lane in Strood. The location and original layout are shown on the 1865 map below. Females were housed at the west of the site and men at the east. The front block on Gun Lane had a central entrance archway with the Master's quarters at the right, with the boys' accommodation beyond, and male probationary ward at the far end. Left of the entrance were the porter's lodge, clerk's room and board room, with the girl's accommodation and female probationary ward beyond. At the rear, a T-shaped block contained the wash-house, laundry and kitchen in its central stem, with men and women housed in the three-storey ranges leading off to each side. The area between the entrance block and the T-block was divided by a further laundry block on the women's side, and by workshops on the men's side. 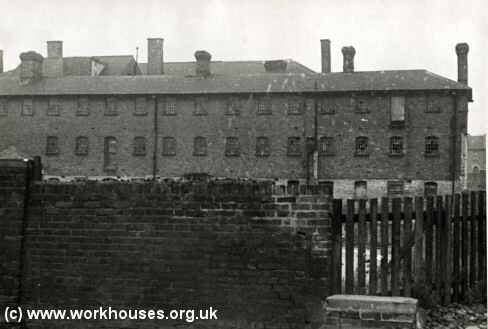 Separate ward blocks stood to each side of the main workhouse. 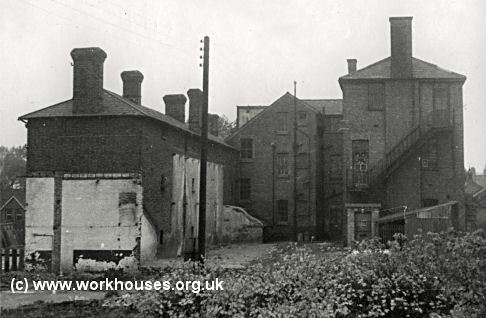 Strood workhouse men's wing from the south-east, 1957. By 1887, the workhouse could accommodate 521 inmates. An infirmary was erected at the east of the site in 1869. 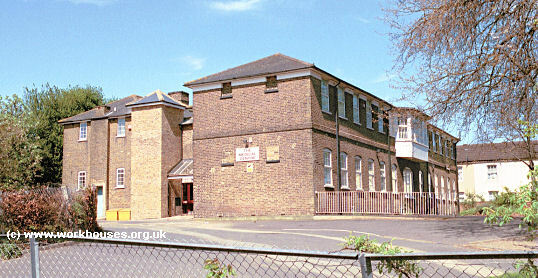 Strood infirmary block from the south-east, 2001. In around 1893, a large new block was erected at the centre of the workhouse replacing the old dining-hall and kitchens and presumably incorporating similar facilities. An additional accommodation was also added in a block erected at the centre rear of the workhouse — in the 1950s, this was still in use as a local authority clinic. Strood workhouse men's wing (left) and new accommodation block (right) from the north-east, 1957. In the 1950s, the 1869 infirmary block was being used as offices for the War Pension Welfare Service. It later housed the Medway Teachers' Centre. In 2001, this was the only surviving part of the workhouse and was being used as a doctor's surgery. In 1913, Strood was operating scattered homes for children at 49-51 Goddington Road and 32 Bryant Road, Strood. By 1924, the Goddington Road home had closed and the Bryant Road home then accommodated 40 boys, girls and infants over 3. Medway Archives Centre, 32 Bryant Road, Strood ME2 3EP. Holdings include: Guardians' minutes (1835-1930); Admissions and discharges (1901-32); Births (1884-1902, 1914-1930); Deaths (1877-1930); Creed registers (1882-1936); Deaths (1871-1937); Punishments books (1901-36); etc. Ancestry currently has: Admissions and discharges (1901-3, 1906-16, 1928-36); Births (1884-1902, 1914-16); Deaths (1871-1937).